Yep! -- puts right hand down -- count me in! I was a victim, oh eight years ago and I'm still p*ssed about it. I mean, who does that? And it's not like I had the most gourmet lip-smacking lunch known to man. A lame sandwich and some carrot sticks! Guess lunch stealers just don't discriminate, gladly lifting even the most boring, run-of-the-mill meal. Worry be gone! Now you can arm your lunch properly with the anti-theft lunch bag! These clear plastic sealers come with a green icky fake-mould splotch on both sides so it looks like your ham & cheese is growing a healthy science experiment. Fear no more! 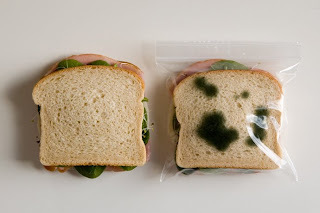 With these baggies, your lunch will be happily waiting for your return. Genius! I love this! Except I can totally see someone opening the fridge, being disgusted by the mold, muttering under their breath something about working with pigs and then quickly chucking it in the trash. Yet another reason I now what an office job.